Come visit Baumfolder at Print 2017 booth #1568. Baumfolder’s booth will provide a customer meeting place to speak with equipment specialist, to help answer any questions you may have. Baumfolder continues to provide the best post press equipment in the world. Baumfolder will also be providing information on their latest solutions in the order fulfillment and E-commerce industry. 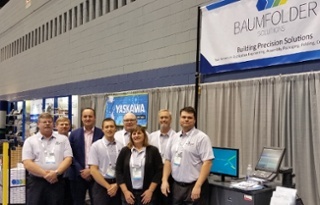 Baumfolder Corporation is a leading producer of equipment for post-press bindery, finishing equipment, mailing equipment products and contract assembly. Almost a century of experience keeps us at the forefront of our industry. Our many years in business and having shipped over 100,000 systems give Baumfolder unprecedented insight into achieving customer satisfaction. This entry was posted in Book Binding, Special Events, Tabletop & Office Equipment, Vendor News and tagged BaumFolder, Print 2017 on August 28, 2017 by Billi Jean Johnstone. Xitron, the leading independent developer of RIP and workflow products for commercial, digital, and high-speed inkjet printing has passed a milestone, now celebrating 40 years as a provider of prepress hardware and software to the printing industry. Xitron’s first products were “blue box” interfaces between newspaper editorial systems and high-speed laser imagesetters, first brought to market in 1977. Xitron’s business model has allowed them to place nearly 35,000 RIPs and over 20,000 CTP and imagesetter interfaces in printing companies on every continent. From Papua, New Guinea to Plainview, New York; Anchorage, Alaska to Cape Town, South Africa; Xitron continues to drive almost every output device used in print production today. In advance of Print’s return to Chicago this September, several new products that build on Xitron’s commercial catalog are slated for release. Included in the line-up are Raster Blaster 4.0, which is an intelligent TIFF catcher for all supported CTP devices; B3, a new network-based interface that doesn’t require a computer platform; and a very economical USB/SCSI interface for legacy Fujifilm platesetters that (until now) could not be upgraded beyond Windows XP operating systems. Driving CTP devices from Agfa, ECRM, Creo, Kodak, Presstek, Heidelberg, Fuji, and Screen, Xitron helps customers who want to maximize their investments by extending the life of their prepress systems. View Xitron products here! This entry was posted in Vendor News and tagged Celebrates 40th Anniversary, Prepress Independence RIP, Xitron on April 11, 2017 by Billi Jean Johnstone. Thanks to Jeff and his team at Highland Computer Forms for partnering with us and for really putting Fidelity through its paces. We are looking forward to many more happy customers as we roll Fidelity out. This entry was posted in Offset Printing, Vendor News and tagged Fidelity Rollers, Pamarco, Pamarco Press, Water Rollers on April 7, 2017 by Billi Jean Johnstone.